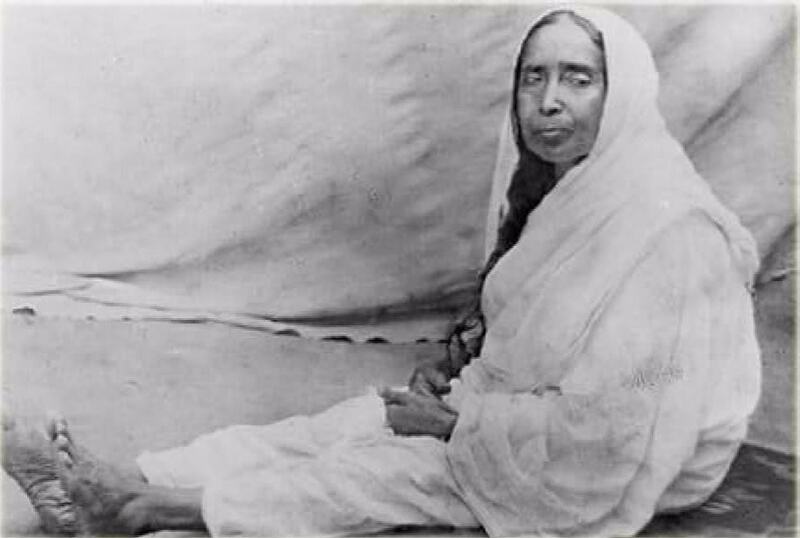 Sri Sarada Devi, known as the Holy Mother, was born on 22 December 1853 in a poor Brahmin family in Jayrambati, a village adjoining Kamarpukur where Sri Ramakrishna was born in West Bengal, India. Her father, Ramachandra Mukhopadhyay, was a pious and kind-hearted person, and her mother, Shyama Sundari Devi, was a loving and hard-working woman. As a child, Sarada was devoted to God, and spent most of her time helping her mother in various household chores like caring for younger children, looking after cattle and carrying food to her father and others engaged in work in the field. She had no formal schooling, but managed to learn Bengali. Even as a child, she had experienced some divine visions and she was very helpful and compassionate towards others. Sri Ramakrishna was indifferent to pursuits of worldly goals as ordinary people are due to his continuous God-intoxicated state while doing his spiritual practices. His family had suggested marriage to him hoping that it would change him. Sri Ramakrishna, without objecting to their proposal, mentioned to them that his bride Sri Sarada Devi was in a nearby town – no one including Sri Ramakrishna had known her until then! So somewhat miraculously, Sri Ramakrishna, who was 25 years of age at that time, married Sri Sarada Devi who was of six years of age (the custom those days in India was an early marriage although the couples lived together only much later as adults). Sarada continued to live at her father’s house, helping her peasant parents with the usual chores while Sri Ramakrishna continued his intense spiritual practices. Years passed by with the bride and the bridegroom seldom meeting each other. As she grew older, neighbors began to gossip about her misfortune saying that her husband had gone mad. Sarada was naturally disturbed over such remarks. She decided to go to Dakshineswar and see for herself the condition of her husband. She found her husband quite normal and loving towards her allaying all her unfounded fears. She stayed with him for some time and then returned to Jayarambati. After some years, when she was eighteen, she permanently stayed with him at Dakshinehwar. At Dakshineshwar, the Holy Mother stayed in a low-roofed octagonal room of less than 50 sq ft area called Nahabat which besides acting as her living room also served as her provision store, kitchen and reception room. She never felt uncomfortable even in such difficult living conditions. Her daily activity began at 3:00 AM with ablutions in river Ganga followed by japa (chanting of the name of God) and meditation till it was broad daylight. 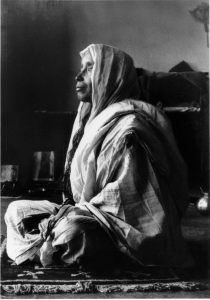 During the day, much of her time was taken up with cooking for the Master and devotees. She prepared the meal for the Master besides cleaning his room, washing his clothes etc. Her cooking grew to enormous proportions later as the number of devotees began to increase. Besides attending her household duties, she also watched from Nahabat the scenes of devotional fervor that went on in Master’s room. During nights she used to spend long hours in meditation. Her whole time was thus occupied with acts of service of the Master and his devotees and with practice of devotional disciplines. In a way, Sri Sarada Devi was Sri Ramakrishna’s first disciple. He taught her everything he learnt from his various Gurus. He began to treat her as the Universal Mother Herself. He said, ‘I look upon you as my own mother and the Mother who is in the temple’. So much so, that he even worshiped her formally as Divine Mother once. The Master trained Holy Mother not only in spiritual matters, but in so-called secular matters also especially in the way to conduct oneself in everyday life. He taught her how to arrange different articles of domestic use, rolling wicks, dressing vegetables, making betel rolls, cooking and doing other items of domestic work. He also instructed her that success in social relationships depended entirely on one’s capacity to adjust in any circumstances. Thus the Master prepared her for the future spiritual mission that would be entrusted to her. When Sri Ramakrishna fell sick with cancer in the throat, he was moved to Cossipore for treatment. By now, he had come to be known as a great religious teacher. Sri Sarada Devi took good care of him attending to his every requirement with great love and care. The Master said, “Well, won’t you do something? Am I to do all?” To this, the Sri Sarada Devi said, “I am but a woman. What can I do?” The Master replied prophetically, “No, No, you have much to do.” Her unrestrained motherly love made her accept many disciples who were not of high excellence unlike those of Sri Ramakrishna. By the time Sri Ramakrishna passed away in 1886, Sri Sarada Devi manifested her Divine Motherhood to become mother of all the followers of Sri Ramakrishna, nay, of the entire humanity, thus gaining the epithet ‘The Holy Mother’. For the thirty-four years or so that she lived after Sri Ramakrishna’s passing away, she inspired people, both monastic and lay, with the ideals that Sri Ramakrishna himself had preached and practiced just as she did. But her life was more testing and complicated than Sri Ramakrishna’s. 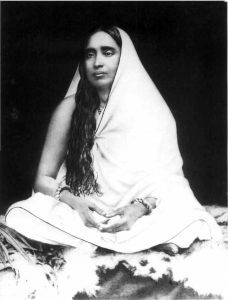 Unlike Sri Ramakrishna who always kept away from the cross-currents of a family life and loved to watch the fun called life but was careful enough never to be drawn into its maelstroms, Sri Sarada Devi, was at the very heart of it. As a daughter, wife, and finally, as the beloved Mother of a large community of people cutting across race and language, there were many demands placed on her, many more than a woman in her circumstances usually had to meet. For a few years after Sri Ramakrishna had passed away, she lived in a very small room with her extended family who quarreled among each other and also mistreated her. But what is remarkable is that, through the skein of all these varying contrasting situations which she had faced, she remained absolutely calm: a true mark of renunciation as mentioned in the scriptures. The Holy Mother taught not by precepts but by examples. There were many irritants in the way people around her behaved, but she was an indulgent mother who knew the best way to educate an erring child was to set an example before them, which she did. She had seen the worst side of people, but she never lost faith in them, knowing that, given affection, sympathy, and guidance, they could overcome all limitations. She was human, yet divine. Her divinity shone through everything she did, even if it was something entirely mundane. She was a simple woman, but in thought, speech, and action she was attuned to God. She was a true saint, but she never claimed she was. She passed as an ordinary woman, but everything about her was extraordinary. Under the strain of constant physical work and repeated attacks of malaria, her health deteriorated in the closing years of her life, and she left the mortal world on 21 July 1920. Sri Sarada Devi, the Holy Mother, was the Divine Consort and the first disciple of Sri Ramakrishna and thus an integral part of His spiritual self and of the saving message he delivered to the mankind. If a person is steady in meditation, he will clearly see the Lord in his heart and hear His voice. The moment an idea flashes in his mind, it will at once be fulfilled and he will be bathed in peace. Everything, no doubt, happens by God’s will, yet man must work because God expresses His will through man’s action. Do not relax your spiritual practices. If you want peace, do not find fault with others. Rather see your own faults. Learn to make the world your own. No one is stranger, my child; the whole world is your own.